Access: On the Menu bar, click Process > Processing Options..., in the Processing Options pop-up click Resources and Notifications. Notifications: Allows to trigger a notification when processing is completed. RAM [GB]: By default all the available RAM memory is used. It is possible to reduce the amount of RAM assigned to the processing of the project by moving the slider to a lower value. CPU Threads: By default all the CPU threads are used. It is possible to reduce the amount of CPU threads assigned to the processing of the project by moving the slider to a lower value. 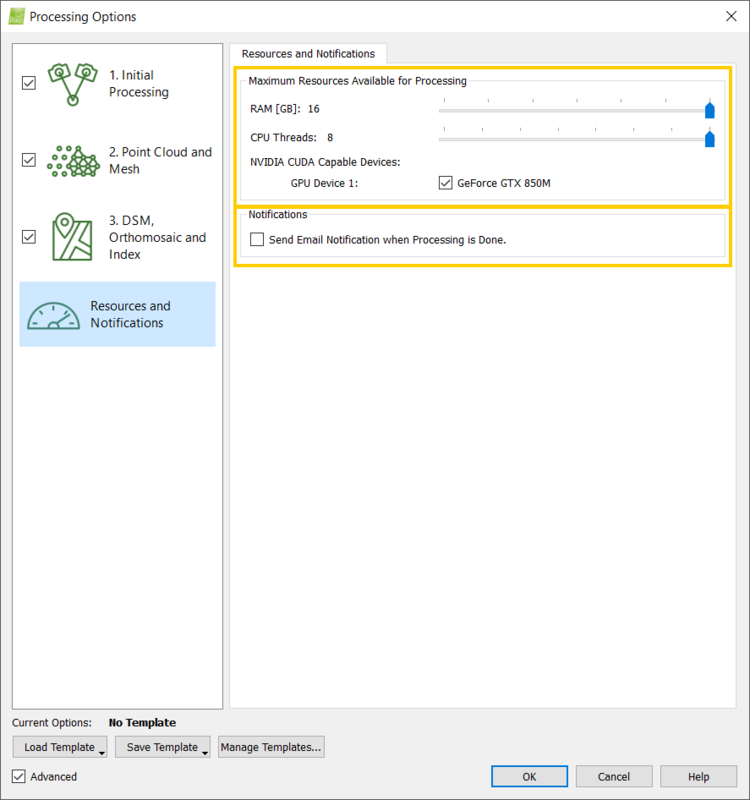 ONLY when using NVIDIA Graphic card(s) compatible with CUDA, it is possible to activate / deactivate the use of the Graphic card(s) by selecting/deselecting the box. When using Cuda processing, the processing speed is increased and the impact is more significant for large projects. Under NVIDIA CUDA capable devices list, the list of GPUs appears . The cards that have at least 2 GB RAM are selected by default. NVIDIA CUDA Capable Devices available. NVIDIA CUDA Capable Devices not available. Tip: When processing several projects of a given size at the same time, the first project starting step 2. Point Cloud and Mesh will use as much RAM as possible. When another project starts processing step 2. Point Cloud and Mesh as well, less RAM will be available and processing might be slower. Therefore, reducing the amount of RAM to be used so that the resources are shared between the projects running at the same time helps to reduce the overall processing time. For example on a 64GB RAM computer, when running 2 projects, set the amount of RAM to 32GB for each project. If the notification box is selected, an email notification will be sent to the email address used to log in Pix4Dmapper when processing is done. NVIDIA OpenGL Driver Error: "Unable to recover from a kernel exception." Error: "The NVIDIA OpenGL driver lost connection with the display driver due to exceeding the Windows Time-Out limit and is unable to continue." My name is Sisva. I'd like to ask you about the NVDIA CUDA capable devices. I am using NVDIA GeForce GT730 with compute capability is 3.5. But, when I want to process the project, it is showed that "NVIDIA CUDA Capable Devices not available". Is there something wrong? Or any drivers that I should installed before? I'll wait for your responses. It explains where to check if your driver version and how to verify if it is updated or not. For your information the operating system that I am using is Windows Server 2012 R2. And when I search the driver, i couldn't find the driver that compatible with my OS. Someone said to me that I could use the NVDIA driver for Windows 8 x64 bit for my Windows Server 2012 R2 x64. Do you know about this matter? I just found out now that I've never used the GPU to process the project because the GPU that I have is not detected.